Last night, we went to Van Nuys HS for what will be our last performing arts performance there (most likely). It was the final show for the 2012 Dance Class at Van Nuys, and the final show that our daughter would be in. As such, it was a bittersweet moment. It brought back memories of the first time we came to Van Nuys HS in 2009 to first see their performing arts program. It’s been a journey, and we thank all the teachers that brought our daughter and her friends this far–especially Marque Coy in the technical theatre program, Mike Nakauchi in the dance program, and Randy Olea in the drama program. 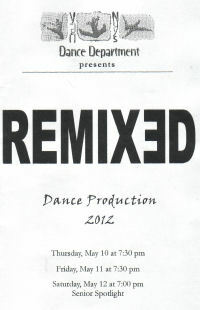 On to the show… the show had three acts: a senior spotlight, followed by two normal Dance Production acts. I’m not going to comment on all the performances, just a select few that I particularly remember. Senior Spotlight. Of course, the highlight of the senior spotlight to me was the program “Georgia”, which Erin choreographed and danced. It is hard to describe — it was a modern interpretive dance — almost primitive. I’ll edit this to add a link to the you-tube of it once it is uploaded. The other performance that I liked was “I Can Be Anything You Like!” by Mayra Martinez and Myelle Bossett (probably because I really liked the music). Act I. A number of really good performances here. Ones I liked (and remembered) included “Time”, choreographed by Mike Nakauchi and performed by the Jazz Dance Team, “Classical Ballet”, choreogrpahy by Natalya Shoaf and performed by Layla Chatthoranongsak, Tatyana Saldana, and Natalya Shoaf, “Pure Imagination”, choreographed and performed by Layla Chatthoranongsak, “Glad to Go” choreographed and performed by Quest Sky Zeidler, “Transatlanticism” choreographed and performed by Erin Geronimi, “Love Sprung” choreographed and performed by Ronamae Septimo and Kevin Garcia, and a nice version of “Cell Block Tango”, choreographed by Tatyana Saldana and performed by Arielle Bell, Tatyana Saldana, Natalya Shoaf, Stephanie Cabrillo, Asha Morris, May Povoorian, Alex Genorilla, and Layla Chatthoranongsak. Act II. Numbers I liked in Act II included the Senior Dance, cheoreographed by the Jazz and Hip Hop Team Officers and danced by a large number of seniors, “Pink Panther”, choreographed by Jayy Rodriquez, JDT and performed by Alex Geronilla, Layla Chatthoranongsak, Tatyana Saldana, and Natalya Shoaf, “Candy” choreographed by Joseph Cayanan, Aliam Jiles, Diane, Ronamae Septimo and performed by the Hip Hop Dance Team, and the finale “Pure Rock You”, choreographed by Mike Nakauchi and performed by everyone. This act also had another song from Chicago which was performed reasonably well, but I would have preferred if they had done “Hot Honey Rag” and had stronger tap. But that’s just me being a Chicago geek. Upcoming Theatre, Concerts, and Dance: The remainder of May brings the Spring Railfest at Orange Empire, “The Great American Trailer Park Musical” at REP East, and it may also bring “Follies” at the Ahmanson. Oh, and May also has my daughter’s HS graduation. June is more open, but does feature both “Addams Family” and “Million Dollar Quartet” at the Pantages. July I”ve been keepling light until we know the orientation schedule at UC Berkeley and our vacation schedule. As always, open dates are subject to be filled in with productions that have yet to appear on the RADAR of Goldstar or LA Stage Alliance. Erin won a silver in Art, and VNHS won individual gold in Essay and Speech! Our theatre this weekend was at the hyperlocal level: We were at Van Nuys High School to see the final production of the 2012 school year: “How to Succeed in Business Without Really Trying“. This was the final performance of the cohort of kids that entered Van Nuys with our daughter, so we know many many folks in the cast. How did Van Nuys do? Pretty good, for a high school production. This wasn’t quite up to last year’s Evita, but I think that is partially due to the story, and mostly due to music problems. On the acting level, the show was pretty good. 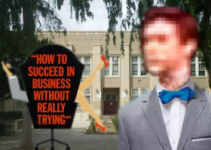 “How to Succeed in Business Without Really Trying” (henceforth, H2$) is perhaps the most successful business musical to succeed in the early 1960s (when there was a bunch of such musicals, including “How Now Dow Jones” and “Let Em Ride“, both big failures). It was written by Abe Burrows, Jack Weinstock, and Willie Gilbert, based on Shepherd Mead‘s 1952 book of the same name. It had music and lyrics by Frank Loesser. It opened on Broadway in 1961 with Robert Morse in the lead, was made into a movie in 1967, had a successful revival in the 1990s with Matthew Broderick, and is currently in a 2nd revival on Broadway, first with Daniel Radcliffe and now with Nick Jonas. H2$ tells the story of the rise of J. Pierpont Finch from a lowly window washer to chairman of the board, all in a very short time thanks to a very little book. Along the ascent, the show skewers business as it was in the 1960s… from the girls in the steno pool wanting to marry their boss, to doing things the “corporate way”, to the closed-in culture of business at the time. The show is extremely set in the 1960s — I was noting that many of the jokes would not be recognized by a teen audience (such as an advertising executive with the initials BBDO, to a reference to a club for the diners, and so on). A detailed synopsis can be found on the Wikipedia page. Van Nuys did a reasonable job with the show. Perhaps the weakest point was the orchestra, which had a number of out of tune instruments that were painful to hear. The second problem is something inherent in a high school production: some of the kids are better singers than the others. In general, the seniors in the production could sing quite well — this included actors portraying Finch, Smitty, Bigley, and Ms. Jones. The younger actors were more spotty: mostly they sang good, with the occasional off note. The talent is there, so I’m sure they will get better as they do more shows (we’ve seen this happen with the current crop of seniors). The last problem with the show was the directions: there was an overuse of the hands with gestures as people talked and sang. This is something you notice when it goes beyond natural movement, and is quite common in stage productions. There were also some microphone problems, especially in the second act where the microphone for the solo in the last big number went out completely. Van Nuys also made some minor changes in the script due to casting– in particular, they cast B.B.D.O. as a woman, and had some women executives in the washroom scene and the final scene. This was likely due to the availability of cast members, but was jarring. Business in the 1960s was extremely sexist: there were few (if any) women executives. Women were secretarys; men were executives. In fact, women executives were viewed with suspicion. The purpose of this show was to highlight and exaggerate this sexism; thus the women executives were incongruous and distracting. As I said before, the actors did really good (especially considering that this was a high school production). The seniors (designated with *) were particularly good. In the lead positions were Sean Scott* as J. Pierpont Finch and Sophie Taylor as Rosemary Pilkington. Scott was very good as Finch — good singing voice, a playful boyish quality. He needed just a bit more impishness to be perfect. Taylor was pretty good as Rosemary — she had a few off notes, but her acting was spot on and she had the lovability needed for the character. She could do with a little more visibility of the inner hardness and drive. Her character in the story is attracted to Finch because she is equally calculating and focused on getting her goal, only her goal is different. Seeing that drive is critical. According to her bio, this was her first play at Van Nuys, so I’m sure she will be getting better and better as they years go on and her talent is honed. Shows of this era had a comic second tier. Playing these roles in this show were Erin Geronimi* as Smitty and Dominique Bautista as Bud Frump. Geronimi was very good as Smitty: she had the comic timing down pat, sang well, and acted well. I particularly enjoyed how she handled Been a Long Day. Bautista was reasonably good as Frump. He had the singing down well, but Frump is supposed to be a true comic character (the originator of the role was Charles Nelson Reilly). Bautista needed to be a bit more playful and clownish, but hopefully those skills will be honed as he does more roles. According to his bio, this was his first play; given that, his performance was remarkable for what it was. There are a number of featured players in this show. A Van Nuys favorite, Quest Sky Zeidler*, was playing J. B. Biggley. We’ve seen Quest grow in his skills since his middle school days as a wolf. He handled Biggley well — the singing, the acting, and the dancing. I’m sure we will be seeing him go on to do great things. Also strong was Ariel Kostrzrewski as Hedy LaRue. Initially, I wasn’t sure she had the right look for LaRue, but her performance sold me that this was a great role for her (and with a bit more padding, she would have been perfect). Also notable was Vivian Cermeño who got the featured spot in Brotherhood of Man. Even with the microphone problems, you could hear the quality and power of Ms. Cermeño’s voice. Cermeño is a freshman, so I’m sure that Van Nuys will have some really good productions in the next two years as she matures in vocal and acting qualities. Lastly, Jade Field did good as Ms. Jones, particularly in the first scene she has with Finch. She was also hit with the microphone problem in the last big number. Rounding out the cast were: Jazmine Aguilera (Chorus), Cydell Bossette (Mr. Gatch), Luis Carranza (Tackaberry), Ana Chaglasyan (Chorus), Lucky Cortez (Mr. Twimble), Henry Etchison (Mr. Bratt), Darwin Gallegos* (Chorus), Josias Garcia* (Davis), Jose Daniel Herrera (Jenkins), Cris Morgan (Book Voice), Melodie Muñoz-Lestrade (Toynbee), Sameer Nayak* (Wally Womper), Flavia Ponce (Peterson), Kim Reyes* (Chorus), Samantha Robbins (Chorus), Anjela Tokadjian (Ms. Krumholtz), Sue Turjman (Chorus), Alyia Yates (Ms. Ovington), and Priscilla Zambrano (Chorus). The production was directed by Mr. Randy Olea. Robbyne Kermesse was the vocal director, and Anita Morales did the choreography (I’ve always wondered by the excellent Van Nuys Dance department isn’t consulted on choreography — it would be a wonderful way to provide synergy to the overall program). Turning to the technical side. The sets, which worked reasonably well, were constructed by Mr. Tom Kirkpatric and his students, based on a design from the University of Missouri. There were some anachronisms, but finding 1960s props is getting harder and harder. Sound and Lights were provided by Mr. Marque Coy and his team, including Jessica Andrade, Kenji Kang, Sierra McDuffee, Marion Paguio, Clarissa Tangloa, and Karina Vega on sound and Joshua Nicolas, Kacie Rodriguez, Joseph Tarfur, Kevin Vasquez, and Marelen Villalta on lights. Sound was OK in the first act, but had problems in the second. Lighting was more naturalistic (i.e., white), but I don’t know if this was a directoral choice or a reflection of new lighting people (I miss the days my daughter was doing lighting–she had some great creative talent there). Alicia Ryan Lee was Stage Manager, assisted by Gabriel Dominguez and Leisa Duya. The Orchestra was led by Mr. Robert Eisenhart and Mr. Brian McGaffey and had lots of people that I’m not going to list. They made a valiant effort with the difficult score, was had problems due to some out of tune instruments (in particular, it sounded like there was a problem with the violins). I did appreciate that attempt to get a typewriter sound effect during A Secretary is Not a Toy, but they needed to be a bit stronger on the electric razor effect for I Believe in You (which could also have benefitted from electric razors on the stage). This is likely the last Van Nuys HS drama department production we will see. Over four years (actually a bit more, as we saw one production when Erin was in 8th grade) we’ve seen this program become bolder and attempt harder and harder works. From the overdone “Grease” to works such as “Damn Yankees”, “Evita”, and now “H2$”, we’ve seen Van Nuys try things that most high schools do not do. We’ve seen students grow as actors and singers. Van Nuys HS has an underappreciated drama program, and the community needs to applaud these hardworking students and staff members for what they do. It’s not always perfect, but hey, this is high school. Upcoming Theatre, Concerts, and Dance: Next week sees us in West LA for “New Jerusalem, The Interrogation of Baruch de Spinoza at Talmund Torah Congregation: Amsterdam, July 27th, 1665” at the Pico Playhouse. March continues with “American Idiot” at the Ahmanson, and “Journey’s End” at REP East. March will conclude with Tom Paxton in concert at McCabes on 3/31. Continuing the look ahead, April will bring “Billy Elliot” at the Pantages, the Southern California Renaissance Faire, “Once Upon a Mattress” at Cabrillo, and “Dames at Sea” at the Colony. May will bring “The Great American Trailer Park Musical” at REP East, the senior dance show at Van Nuys HS, and may bring “Heiress” at the Pasadena Playhouse, “Follies” at the Ahmanson, and the Spring Railfestival at Orange Empire Railway Museum. As always, open dates are subject to be filled in with productions that have yet to appear on the RADAR of Goldstar or LA Stage Alliance. By “we”, of course, I mean my daughter. The Van Nuys High School Academic Decathalon team got a very nice write-up in the LA Daily News. You may be wondering where my daughter is in the article. She’s the “Erin Ireland” quoted at the end. You see, the reporter, upon hearing her name, asked her to spell it. She said “Erin, as in Ireland”… and … you can see the results. We’ve sent in a correction. I should note that she’s been working her tush off on this competition — on top of her 4 AP classes, she’s studying all hours of the day (with multiple multi-inch binders of material). I hope Van Nuys does well. P.S. : Don’t forget that I’m still looking for information on HTML Editor recommendations. No one responded yesterday. P.P.S. : Don’t forget today is Boardgaming at Temple Ahavat Shalom in Northridge. Last night, we went to see the “The Heidi Chronicles” at Van Nuys High School; this play is alternating with “Latina“, which we saw last week, as Van Nuys’ Fall production. “The Heidi Chronicles” is a 1988 drama by Wendy Wasserstein, winner of the 1989 Pulitzer Prize for Drama, that tells the story of Heidi Holland from her days in high school in the 1960s to her career as a successful art historian more than twenty years later. The story is told through a number of scenes at key junctures: 1965, at a school dance, where we learn who Heidi is, who her friend Susan is, and where she meets one of the key men in her life: Peter Patrone; 1968, at a Eugene McCarthy ralley, where Heidi meets Scoop Rosenbaum, the other key man in her life; 1970, at a women’s consciousness raising group; 1974 outside the Chicago Art Institute where she learns Peter is gay; 1977 at Scoop and Lisa’s wedding; 1980 at Lisa’s baby shower; 1982 with Peter and Scoop on a talk show; 1984, at a lunch with Susan; 1986 at a high school alumni speech; and 1987 at a hospital with Peter; and 1989 in Heidi’s new apartment. Each act is opened with a scene of Heidi lecturing about women artists and heir art. Per Wikipedia, the play’s main themes deal with the changing role of women during this time period, describing both Heidi’s ardent feminism during the 1970s and her eventual sense of betrayal during the 1980s. When I contrast this with the alternating play, I didn’t like this one as much. I’m not sure why: the story is more accessible (Latina had many portions in Spanish); I understand the times better; and (at least according to critics and the Pulitzer committee) the story is better crafted. My guess is that it was the presentation: this play was further from the student’s experience, and this made it harder for them to turn the characters into living and breathing people. I think it was also complicated by last night’s performances: there were lots of line problems, and for many of the actors, the presentation seemed rushed, making it a recitation of lines. Another problem was character confusion: As some of the students played multiple characters, they did not distinguish them enough through acting mannerism to make the audience realize these were different characters. That’s something the director, Randy Olea, might have addressed had he realized it. As the lead, Ariel Kostrzewski did reasonably well as Heidi. She was weakest in the framing scenes (the art lectures), where the rushed delivery led to the point of the framing scenes being lost. When interacting with other characters, she was much stronger and more believable. Providing her strong support were Quest Sky Zielder as Peter Patrone, Mike Hill as Scoop Rosenbaum, and Erin Geronimi as Susan Johnston. Quest, in particular, was notable for his strong delivery, his embodiement of character, and the humor he conveyed to the audience. Mike was also very strong as Scoop, delivering and acting well. Erin, who was also strong in Latina, portrayed the friend quiet well. Rounding out the cast were: Vivian Ceemeño as Becky, Gabriel Dominquez as a waiter, Jade Field as Debbie, Priscilla Legaspi as April, Taylor Morris as Jill and Betsy, Melodie Muñoz-Lestrade as Lisa, Flavia Ponce as Clara, Kim Reyes as Denise, Alex Reynoso as Chris, Mark, and Doctor Ray, Denisse Rodriguez as Molly, and Priscilla Zambrano as Fran. Turning to the technical. The set, develoed by Mr. Tom Kirkpatrick and his students, was relatively simple: triangular pillars and a number of props. It was sufficient to convey the times, but not much else. Sound and lights were provided by Mr. Marque Coy and his students. The sound worked better for this show with fewer microphone problems. Lighting was good, although I was unsure about the use of the moving lights before and after the show. Charlie Glasser and Clarissa Tanglao were technical stage managers, with Kenji Kang and Sierra McDuffee doing sound, and Kevin Vasquez, Kacie Rodriguez, Glory Smith, and Joseph Tafur doing lighting. One technical problem in the auditorium: although it was a cold and rainy night in LA, last night the air conditioning in the auditorium decided to run full blast. As always, where the Van Nuys production team lacks is publicity and program. This production is not well advertised: there should be posters in local businesses, as well as announcements at local middle schools (to attract students to the magnets). It should be clear on the school’s website, and have easily findable pages on Facebook. It should also have a stronger program: there should be advertising sold in the program so that local businesses can (a) learn about the production and (b) support the school. They have done this for the yearbook and sports programs; it should be in the drama program as well. The program should also provide additional information on the show itself—in particular, identifying the author, the rights management company, and when the show was first produced (or notable LA productions). There’s also no reason a mechanism such as eventbrite shouldn’t be available so that tickets can be purchased in advance; using Goldstar would be even better, as the production would gain advertising as well. Last night was the last performance of “The Heidi Chronicles“. You can catch the final performance of “Latina” tonight at 7pm for $8. Information at http://vannuyshs.org/. Upcoming Theatre, Concerts, and Dance: Tonight takes us to Long Beach to see “The Robber Bridegroom” at ICT. Next weekend brings “Day Out With Thomas” at Orange Empire (We’re working Veterans Day). Veteran’s Day weekend brings “Sylvia” at the Edgemar Center for Performing Arts in Santa Monica on Saturday 11/12; the following weekend brings “Chitty Chitty Bang Bang at the Simi Valley Cultural Arts Center on its opening night, November 19. Karen will also be seeing “Riverdance” at the Pantages on November 16. I’m still waiting to ticket “Bring It On” at the Ahmanson (held for November 25, pending ticketing, hottix on sale for our block on November 8). Thanksgiving weekend also brings the last show of the REP season, “The Graduate”, on Saturday November 26. The first weekend of December is lost preparing for ACSAC, although I might squeeze in something on Saturday. The next weekend is busy, with a Mens Club Shabbat in the morning, and “Travels with my Aunt” at the Colony Theatre in the evening. The remainder of December is unscheduled, but I’m sure we’ll fill things in for Winter Break. Of course, there is the de rigueur movie and Chinese food on Christmas day. January, right now, is completely open, although the first show of the REP East season will likely be in there somewhere. As always, open dates are subject to be filled in with productions that have yet to appear on the RADAR of Goldstar or LA Stage Alliance. So far, our experience with the Fall Van Nuys High School non-musical production has been spotty. Usually they have been ethnic comedies (Scapino, Varney the Vampire) that no one has heard of, or classics executed poorly. This year, however, Van Nuys did something different: Two dramas in rotation. We saw one of them last night, “Latina“, by Milcha Sanchez-Scott. Van Nuys did an excellent job with the drama—much better than their comedies—and even with the normal HS production flaws, I would recommend this production. “Latina“, at its heart, is a bilingual exploration of the hispanic immigrant experience. The lead character, Sara Gomez, is trying to embrace the American experience and blending in. She has gone the proper path: learned flawless English, gotten her citizenship, gotten a job. But she’s still sterotyped by her looks and her names, and she fears being treated as a maid, and hates losing jobs because she’s “too exotic”. She also has blended in so much she no longer stands up for her heritage when people drop into “those people” stereotypes. She works as a secretary at a domestic agency, and her coworkers and the employment pool reflect the other sides of the immigrant experience: the businessman who wants to make it in the American world, the workers with green cards who both attempt to get jobs while retaining their heritage, to the illegals who are in fear of “la migra”, and retain their fears. It is a dramatic story that draws you in because it is obviously drawn from real experience; further, I think this is an experience that will resonate with the demographically-higher-hispanic audience of Van Nuys HS (and it did, as demonstrated by the quiet during the performances). The acting, for the most part, was spot-on and not overdone—which is rare for a high school production. In fact, I can’t really think of areas that were overacted; the problems were more the occasional line hesitations and pauses. Those aren’t a big deal; these actors have a lot on their mind, what with college application season being in full force. The directing, by the drama teacher Randy Olea, was actually pretty good: he made actors who don’t know spanish sound hispanic with few problems (although at times, I was wondering why they were talking about so many “jews” on stage). But they got the language right, they moved in a believable fashion, and they presented their emotions in a believable, non-overdone fashion, which is all one can really ask for. Some of the performances were really excellent. There are a few folks I’d like to highlight. As the lead Sara/Sarita Gomez, Priscilla Legaspi was excellent—believable, and vivacious and all-together a delight to watch. Also strong was Quest Sky Zeidler as Don Felix Sanchez. I’ve seen this young man grow in skill from his days at Nobel Middle School, and he’s turning into a fine actor who did a great job as the grasping businessman. Quest may believe this is yet another wicked role, but it is really a valid portrayal of how many businesspeople will try anything to get success in America. Erin Geronimi was strong as Clara, and I also enjoyed the performances of Kim Reyes as Maria, Denisse Rodriguez as New Girl, and Jade Field as Alma. Rounding out the cast were Vivian Cermeño as Evita and Little Sarita, Gabriel Dominguez as Mr. Levine, Michael Hill as Mr. Camden, Ariel Kostrzewski as Mrs. Holmes, Taylor Morris as La Cubana, Melodie Muñoz-Lestrade as La Chata, Flazvia Ponce as Lola, Alex Reynoso as Father Ignacio and Mr. Harris, and Priscilla Zambrano as Doña Eugenia. Henry Etchison, Maya Hallowitz, Flavia Ponce, and Alyia Yates served as stage managers. Turning to the technical. The set, develoed by Mr. Tom Kirkpatrick and his students, was relatively simple: two rooms, a number of props… but it was sufficient to convey the locals and to be quickly turned around for their other production. Sound and lights were provided by Mr. Marque Coy and his students. The sound had problems at times, but this is a known problem with the microphones that the school has, and the actors who are not fully trained in how to use them best. Lighting was adequate for the task, although there were a few miscues. Charlie Glasser and Clarissa Tanglao were technical stage managers, with Kenji Kang and Sierra McDuffee doing sound, and Kevin Vasquez, Kacie Rodriguez, Glory Smith, and Joseph Tafur doing lighting. If there is anything I fault the Van Nuys production team on it is publicity and program. This production is not well advertised: there should be posters in local businesses, as well as announcements at local middle schools (to attract students to the magnets). It should be clear on the school’s website, and have easily findable pages on Facebook. It should also have a stronger program: there should be advertising sold in the program so that local businesses can (a) learn about the production and (b) support the school. They have done this for the yearbook and sports programs; it should be in the drama program as well. The program should also provide additional information on the show itself—in particular, identifying the author, the rights management company, and when the show was first produced (or notable LA productions). There’s also no reason a mechanism such as eventbrite shouldn’t be available so that tickets can be purchased in advance; using Goldstar would be even better, as the production would gain advertising as well. I strongly recommend that you go see “Latina“. The price is right—$8. There are two more performances: Thursday, November 3rd and Saturday, November 5th at 7:30pm (doors open at 7:00pm) at Van Nuys High School, Running in alternation with “Latina ” is “The Heidy Chronicles“, which has performances on Saturday October 29th and Friday November 4th, same times. Upcoming Theatre, Concerts, and Dance: Tonight brings “Victor Victoria” at the Malibu Stage Company on Saturday. November will start with “The Robber Bridegroom” at ICT on November 5. It will also bring “Day Out With Thomas” at Orange Empire (We’re working Veterans Day, but we’re not sure about the weekend yet). Karen will also be seeing “Riverdance” at the Pantages on November 16. I’m still waiting to ticket “Bring It On” at the Ahmanson (held for November 25, pending ticketing, hottix on sale for our block on November 8). Thanksgiving weekend also brings the last show of the REP season, “The Graduate”, on Saturday November 26. Also of potential interest, if time is available, are “A Sentimental Journey: The Story of Doris Day” at the El Portal (Nov 2-20), “Don’t Hug Me, I’m Pregnant” at the Secret Rose (9/30-11/20; Theatremania has $10 tickets with code “PREGNANT”); or “Chitty Chitty Bang Bang at the Simi Valley Cultural Arts Center (11/19-12/16). Not of interest is “South Street” at the Pasadena Playhouse, given the reviews. The first weekend of December is lost preparing for ACSAC, although I might squeeze in something on Saturday. The next weekend is busy, with a Mens Club Shabbat in the morning, and “Travels with my Aunt” at the Colony Theatre in the evening. The remainder of December is unscheduled, but I’m sure we’ll fill things in for Winter Break. Of course, there is the de rigueur movie and Chinese food on Christmas day. As always, open dates are subject to be filled in with productions that have yet to appear on the RADAR of Goldstar or LA Stage Alliance.